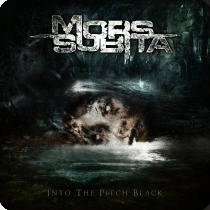 Hailing from Finland, Mors Subita returns with a cracking new album entitled Into The Pitch Black. Path to the Abyss begins with acoustic guitars and sets a haunting introduction, belying the calm before the storm. As Humanity Weeps is fast, pounding, and sharp. The guitars are thrashy and filled with anger, the vocals are piercing, filled with rage and a deep desire for something more. This is a cracking opening song. Dead Sun builds on As Humanity Weeps, making the melodies and the dark slabbing metal a forefront in its assault. There is a lot to like in this, it builds up and reaches maximum optimisation. Defeat is technical, a mix of brutal riffage and solid thumping metal slabs, that breed chaos and mosh pits. Title track Into the Pitch Black is melodic, with sharp fills, and big driving guitar leads, the vocals are as ever on point and sharply focused. Alas is mathematical metal shaped behind the sharp guitar hooks and the drums that pound into the rhythm and shape the song. I, God is furious from the onset, with pounding rhythms, the guitars smack right into and the song is one huge wall of metal. Vultures contains the darkness of metal within and ensures that the riff is one catchy piece of aggression. Fear Is Just the Beginning is classic black metal, with the arpeggiated leads and the tremolo picked introduction before moving into fast blitzkrieg esque metal. Shadows is haunting, slow paced and dark and filled with guts and glory. The Void is fast, furious, dark and heavy, a brilliant way to close the album.